The worlds markets are focused on Sunday when Greece votes on whether to accept terms of an agreement that could salvage the Greek economy. All the world’s financial markets are focused on Sunday’s referendum in Greece when citizens of the world’s oldest democracy will vote on whether to accept terms of a new agreement that could salvage the Greek economy. A No vote, which has been championed by Greek Prime Minister Alexis Tsipras, could pave the way for a Greek exit from the euro zone and all the complications that would ensue. But a Yes vote is not seen as a panacea that sets things straight once and for all. It’s complicated. Most immediately, a No vote means Greek banks would go bankrupt, which would also impact their subsidiaries in neighboring countries including Bulgaria, Servia, Albania, Cyprus, Romania and Macedonia, says Jacob Kirkegaard, senior fellow at the Peterson Institute for International Economics. Eventually it could mean that Greece leaves the eurozone, which raises questions about the long-term viability of the precedent-setting economic experiment. A Yes vote, in contrast, would yield a positive reaction in financial markets, says Kirkegaard. 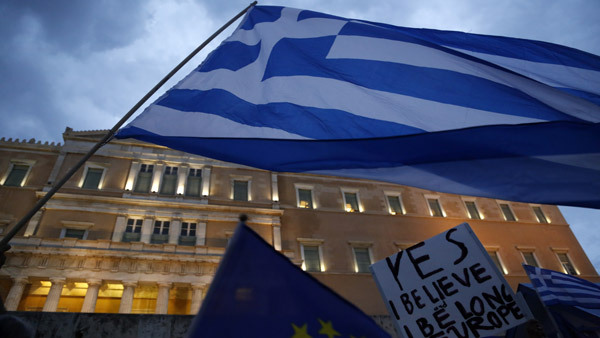 “It’s the least bad outcome and means there is not a Grexit (a Greek exit from the eurozone). But even a Yes vote is very problematic,” says Kirkegaard. Greek banks, which have essentially been closed all week, will not automatically reopen and still need liquidity. And a Yes vote would be a defeat for the current Greek government, which raises questions about who Greece’s creditors—primarily the IMF, ECB and European Commission – could negotiate with. “There’s no more money unless there is a new government,” says Kirkegaard. Yanis Varoufakis, Greece’s finance minister, told Bloomberg TV on Thursday that he would step down if there’s a Yes vote. John Lekas, CEO and senior portfolio manager of Leader Capital Corporation, a mutual fund company with $1.2 billion in assets, expects markets will sell off no matter the outcome of the Greek vote and says “peripheral Europe” and technology will be the most vulnerable sectors. Still, he says GREK, an ETF comprised of Greek stocks, could be buy if there’s a Yes vote. GREK is down about 21% year-to-date. The big question now is how Greek citizens will vote, and they appear much divided. In a poll of 1,000 people published Wednesday and conducted for French bank BNP Paribas, 47.1% said they planned or were likely to vote Yes; 43.2% planned to vote No or were leaning that way.